In the book of Ephesians, Paul writes to the church of Ephesus, or the churches surrounding Ephesus, to urge Christians of the need to conduct themselves in a Christ-like way. These are some very general but great themes that pertain not just to a single church, and they apply just as much to us today. We do not live with clear knowledge or revelation of what is going on in the Spiritual realm, real-time. Job did not know about the exchange between God and Satan that led to his time of suffering, and even though we’re told because of the revelation of the Bible, we only know of the two heavenly meetings – we know not of much else. We do not live today getting an alert on our smartphones that ‘Ding, Satan has now taken a foothold in your heart’ or ‘Ding, Satan has now occupied 10% of your heart’. These things are in the Spiritual Realm, and we can neither see nor connect our phones or minds to. So how do we know when the devil has a foothold in our lives? What is a foothold in our lives? In this study, we will look at the what are some of the common footholds that the devil has over us and what we can do about them. foothold – in many other versions the term ‘place’ was used. Do not give place to the devil. In a few other versions, the term ‘opportunity’ was used. Do not give the devil an opportunity. These terms are easier to understand, but I like the term foothold because it gives us a blatant analogy as well. A foothold is a technical term in certain sports, like climbing, where your foot is able to secure a position in which it is safely lodged in, so that you are able to place your weight on it and continue climbing. Hence, a foothold needs to be strong and secure – it can’t be a shallow bend where you’re barely able to stick your toes into, and it can’t be a falling edge where you don’t dare to adjust more of your weight onto. In english, a foothold, by extension, also refers to the position that which is secure and from which further progress can be made. In other words, when we read this verse, it is essentially saying, do not give the devil a secure position in your heart/life that enables him more room to work on further progress on you. devil – unfortunately there’s just a little bit of negative connotation to the term ‘foothold’, it seems. Nobody will ever use the same term to describe God – you’ll never hear somebody say, we should give God a foothold in our lives. Yes, yes, that statement is inherently incorrect in itself, God should not just own a foothold in our lives, but he should be in the driving seat, he should fill our entire hearts. But what is it about the devil that we need to guard? What is it about the devil that is so dangerous? It is obvious, isn’t it? The devil tempts us. The devil will lead us into sin. It may sound like we’re trying too hard to pin some blame onto the devil when a lot of the blame should be apportioned to ourselves, but often, even straight-laced and no-nonsense and holier-than-thou christians will fall into sin and temptations because of the existence of sin and because of the traps of the devil. No matter how close we think we are with the Lord, no matter how many years we have been a Christian, it is still possible for the devil to gain a foothold over us. As Christians, as believers and as followers of Christ, we have the Holy Spirit in our hearts. We may grow weak, we may stumble and fall, but no matter how weak and wretched we become, our salvation cannot be taken away from us. No matter how weak and wretched we become, Satan can neither steal our hearts away nor enter our hearts. But if there is a hole in your heart, Satan will step into that hole. He won’t enter our hearts and steal our salvation – he can’t, but he can step into that gap and fill it, tempting you to do evil, say things you shouldn’t, do things you mustn’t. That is giving Satan a foothold. We aren’t giving him our entire hearts, we won’t and he can’t, but we’re negotiating and compromising ourselves and our Lord when we allow a gap to exist in our hearts. When you constantly harbour feelings of jealousy in your heart, you are giving Satan a foothold in your life. Anger is cruel and fury overwhelming, but who can stand before jealousy? [Proverbs 27:4] So too is anger, technically – and we are looking as anger because it is what Paul used as an example in the preceding verse – “In your anger do not sin”[Psalm 4:4]: Do not let the sun go down while you are still angry [Eph 4:26]. Anger, jealousy, deception [Eph 4:25], these are but just some of the more common examples of how we’re trapped into giving the devil a foothold in our lives through regular emotions. It’s like being on cordial relationship with the neighboring country, where there is a very clear-cut border, and each country constantly watch the bordering cities for any hostility. But when one of these countries decides to attempt to conquer a fort from a third country, that lies right on the border line, you cannot allow it, because if you allow it, it will be akin to giving your enemy a strategic location, a military foothold over your country. The enemy will be able to invade you as and when they like if they have a military fort right on the border, and you won’t have time to counter it. What are we to do, then? It’s simple, though nobody said it was easy. Do not sin. Do not start to sin. If there are temptations around you that urge you to sin, run away from them. Do not torture yourself by frequenting a place where there are numerous temptations – that’s like carving a hole in your heart and baiting the devil to fill the gap – he will really do it. Don’t do that, instead, flee from sexual immorality [1 Cor 6:18] and other sins. We need to constantly watch that border. We need to constantly check our own actions and our own hearts. We won’t have a status update whereby we will know for sure that the devil has taken a place in our hearts, but pray for discernment, pray for spiritual discernment, and when you ever are aware of your own sins, that is when you will be aware of the foothold that the devil has over you. 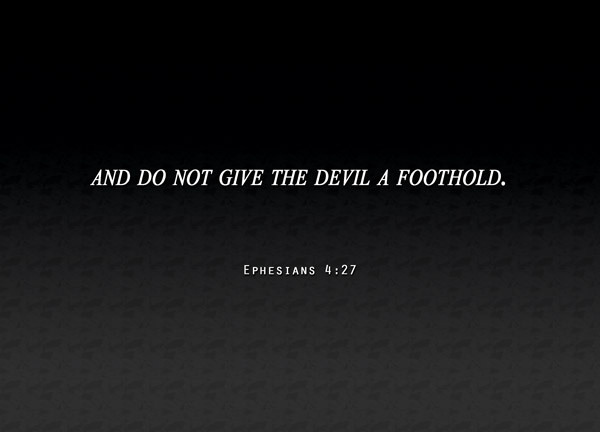 And when you are aware, choose not to give the devil a foothold. Instead, let God fill those gaps in your heart. Reblogged this on Divinely Restored.